Season a turkey breast with salt and pepper. Thinly slice a clove of garlic. Put the breast in a bag, and arrange the slivers of garlic on the breast. Place tarragon sprigs on the breast too. Put the oil in the bag and seal. Sous-Vide at 57C/140F for about 7 hours. Remove from bag, and sprinkle top with paprika, and a little olive oil. Broil top to add color. 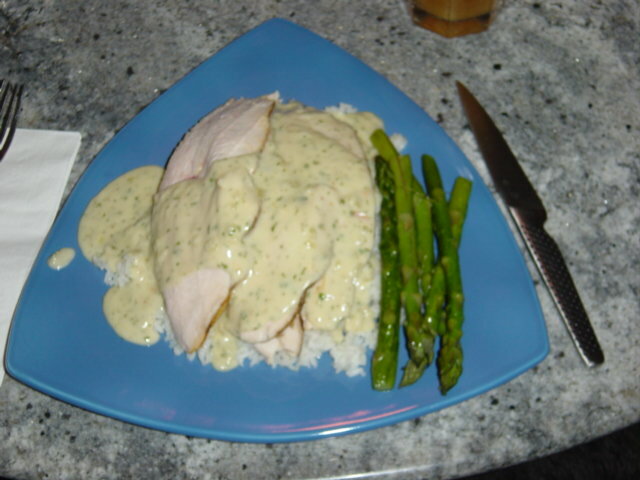 Prepare a cream sauce and add some freshly chopped tarragon.